Here you can find information about our last symposium "Women in Science"
The NRW Chapter of the Society of Spanish Researchers in Germany (CERFA-NRW) aims to bridge Spanish and German scientific research, but also to bring science to a broader non-specialized audience. 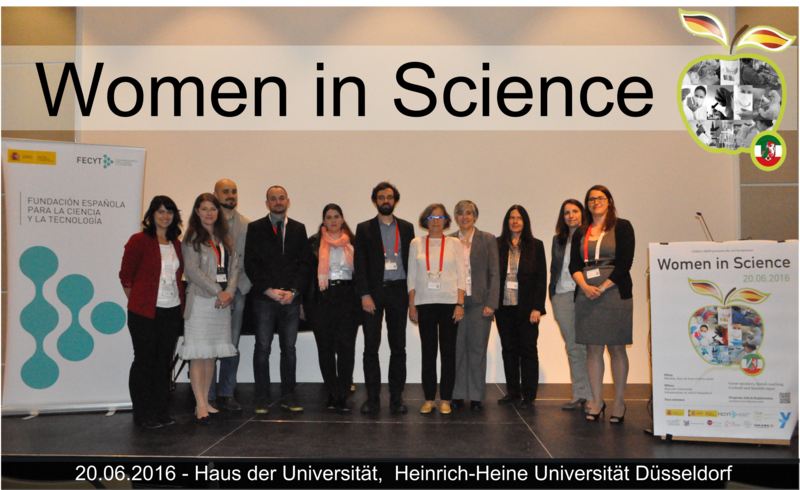 CERFA-NRW is now proudly presenting its 3rd Symposium “Women in Science”, which has taken place on June the 20th in the "Haus der Universität" at the Heinrich Heine Universität (HHU) Düsseldorf. In many scientific careers there are, indeed, much more female than male students. Statistically, women also outnumber their male colleagues as PhD students in many fields, but what happens afterwards? Women in leading positions in R&D in both industry or academia are still nowadays underrepresented. Therefore, we want to provide an open forum for discussing about these issues, and bringing closer role models examples of ground-breaking scientists, who happen to be women. We have heard about their hopes, frustrations and personal experiences but also about their exciting scientific discoveries. Prof. Evamarie Hey-Hawkins told us about her personal experience on the pathway to develop an outstanding career on science. Prof. Daniela Goldfarb from the Weizmann Institute in Tel-Aviv explained us how making electrons dance can help to develop ultrasensitive techniques to explore materials in a very detailed manner. How German mentoring programs can help female scientist to develop their scientific careers? A question taken in the discussion pannel, which counted on Ms. Susanne Müller from the MINTALENTE Program and expert consultant at "Die Jobwerker", Ms. Rosemarie Fleck from the feRNet Mentoring Program and Ms. Ekaterina Matsekina from the Selma Meyer Mentoring Program, HHU Düsseldorf. Thanks to Dr. Balcázar and Dr. Iris Sancho for attending on very short notice (unfortunately Dr. Frauke Kersten and Dr. Leticia Hosta-Rigau could not attend "Women in science"). And finally, a brief couching was offered by Ms. Susanne Müller and Ms. Gerda Reiff during the spanish cocktail and tapas. We will enjoy delicious Spanish tapas that will empower establishing a fruitful networking in a more relaxed atmosphere. The event was a great success. Thanks for joining!